The following is an account written by British wartime pilot, Squadron Leader D.H. Clarke, D.F.C, A.F.C in the book "What were they like to fly", regarding a Macchi C.200 "Saetta" flown shortly after its capture in North Africa. As soon as Rommel began to retreat from Alamein, nearly every pilot in 239 Wing was determined to find a serviceable German or Italian aircraft to play with. It was not long before a Savoia-Marchetti S.M.79 - "Desert Lily" - and later a Heinkel 111, were making regular Cairo runs taking Wing personnel on leave and returning loaded with luxuries of food and drink to share around the five squadrons (Nos. 450, 250, 3, 260 and 112). Bf.109's, Fiat C.R.42's and Stukas became commonplace; a Bf.108, Fiat G.50, Fieseler Storch and a Henschel 126 were amongst the rare acquisitions; but the one type which everybody wanted to fly remained elusive until the Italian capitulation in 1943 - the exceptional, but to us, accursed, Macchi C.202. Sleek, supremely fast - the sight of their high, white-crossed fin would have struck fear into our hearts had the Italians pressed home their attacks. The odd pilot proved that the 202 was capable of mixing it in a dogfight - out-turning our P-40s with ease; but the majority would pull away effortlessly into a climbing roll or a roll off the top when things became at all hectic. There is nothing more exasperating, when you are caning fifty-four inches of boost out of an engine, than to see your enemy indulge in carefree aerobatics; but although we did our damnedest to get near enough to shoot at them, we seldom succeeded. Their aircraft was superior to ours on all counts. No wonder we wanted to fly one. Throughout the advance I made a point of being the first to arrive at any captured airstrip, but the 202's had always been systematically destroyed: axes, sledge-hammers - even acid was used. There were always plenty of other types left in serviceable condition, but the Italians seemed to know that we wanted a 202 and they destroyed the lot! 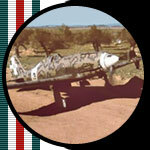 As far as I know only one was found - by the SAAF's - but they kept it to themlselves and I never had a chance to fly it. Still, I did discover the next best thing - a Macchi C.200. I found it at Sorman, an attractive palm-surrounded aerodrome on a hard-surfaced salt lake, halfway along the coast between Tripoli and Zuara. There were some 30/40 C.R.42's and Macchi 200's parked around the two white stucco hangars, every one badly damaged; but a 200 stood in solitary splendour, apparently newly delivered, and the only damage was a smashed windscreen, as though the pilot had childishly heaved a spanner at it before fleeing with the rest of the ground staff. Happily I chalked the squadron markings - LD - on its shiny fuselage, organised a fitter and rigger to give it a thorough check, and three days later I ferried it to our temporary airstrip at El Assa: Macchi C.200 MM 5285 was mine! And what a beauty she was! Although in the end she tried to kill me, it was not her fault, and even now I look back on the few hours I flew in her with considerable pleasure. The cockpit was roomy and open, with no sliding roof to obstruct vision. Instead, two Perspex flaps closed on each side so that when you were shut in, it seemed as if your head was part of the external fittings, and that the rest of you was entirely separate inside. With only a slim headfairing behind, visibility was perfect: without effort you could see right under the tail - a feat which could only be accomplished in a P-40 by sucessive weaving or by opening the hood. There was no bullet-proof windscreen, and although the seat of moulded armour-plate looked pretty it did not give the protection we had in British aircraft. Armament was poor, too: only two machine guns, which were concealed in the fuselage and fired through the airscrew - but ammunition indicators in the cockpit (a useful luxury), registering up to 370 round per gun, showed that a poor shot would have plenty of chances. The finger trigger to fire the guns was on the simple stick-type control column. There were two airspeed indicators, with a pitot head on each wing-tip; rather confusing, but very interesting during a gliding turn. The rest of the instruments were efficient, but not so elaborate as in our fighters, and the only real peculiarity was the throttle lever which worked in reverse: a difficult point to remember when taxying! The engine, an 840 hp Fiat A.74 RC38 radial, was a joy of a sewing machine. I remember being astonished when, at only 1,700 revs, the indicator speed was 365 kms/h - nearly 230 mph! My impression was, and still is, that she was as fast as a Hurricane I, and certainly more manoeuvrable. The take-off run was fantastically short after being used to our heavy P-40's. The handling qualities were finger-light under all conditions. I had some practice dogfights with Hurricane IIs, Kittyhawk III's and Spitfire V's and found I could turn inside all of them. Although they were faster - the Hurricane II only just - the Spitfire was the only one which could outclimb the Macchi 200. The only bad habit I found in her was the way she dropped her starboard wing - suddenly, without warning - just before touch-down. It was odd, because she did not do it when test-stalled in the air. But it was her only vice, and the wide undercarriage prevented damage providing the hold-off was not too high. Otherwise it was best to make a wheel landing - a performance I have never liked. Summing up, if the 202 bore any resemblance to my 200, then the Italians should have been knocking down our Kittyhawks like ninepins; and, earlier on in the war, the 200's should have done much better than they did. 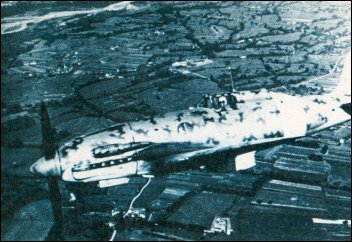 I lost my Macchi on March 5th, 1943. I taxied out for an exhibition dogfight, turned into wind, pulled the throttle open and eased the stick forward. The tail bumped once, twice, but instead of lifting as it should have done, it suddenly dropped and the nose cocked high into the air. I slammed the throttle forward and switched off, thinking I had hit a soft patch of sand. But when I scrambled out of the cockpit and saw that the whole tail assembly had broken away from the canted fuselage I knew that I had been very, very lucky. The Italians HAD used acid after all! World War II, though available in small numbers.